I hate waste. Absolutely can’t stand it. Weekly, I accumulate at least a brown paper grocery bag full of junk mail advertisements, and catalogs. In the past, I have used the service Catalog Choice to reduce some of the unwanted catalogs that I received in the mail. I noticed a small reduction in the amount of catalogs I receive, and was happy to have a least the ones I never look at cease to arrive in my mailbox. If you are under the distress that I once was, I highly encourage you to contact the companies that you receive unwanted catalogs from directly, or use a service like Catalog Choice to stop them from being sent. I like to find a use or purpose for things if at all possible. Anything that is not used, is recycled, upcycled, or donated. 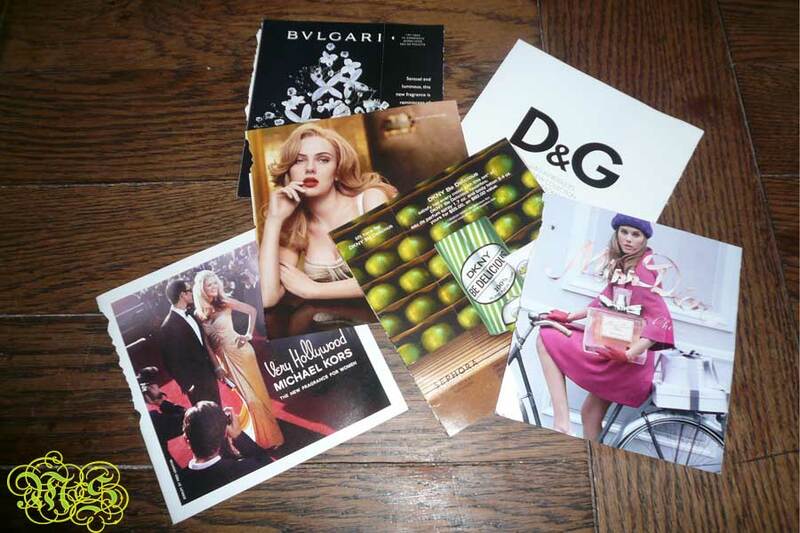 As I was going through stacks and stacks of old magazines over the Thanksgiving holiday, as well as thumbing through the new Holiday 2009 Sephora catalogs I realized that those innocent little perfume adverts are incredibly useful and handy. -tuck one into your wallet to keep your greenbacks fresh. – any many, many more.. remember possibilities are endless!! Categories: Uncategorized | Tags: Cosmetics, Eco Friendly, Style, Travel - Shop exclusive sales. | Permalink.